A while back, annoyed by the appearance of the Address Book and iCal applications in OSX 10.7 (Lion), and inspired by Giles of Simple and Usable, I created a silver skin for Address Book. 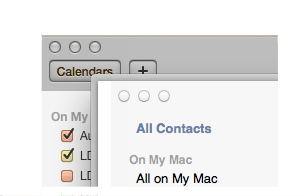 Mountain Lion has improved the Address Book interface, and renamed it "Contacts". It's great that you can now see groups, group members, and contact details in one window; they've done away with the awkward switching between groups. But they've retained the somewhat annoying attempt to look like a real, leather bound, address book. Similarly, there's a better appearance to the renamed Calendars, but they've retained the silly leather bound look, and torn off paper look. So, I've created silver skins for both of these. And I've gone one better by creating a proper installer package. You can choose which app to fix using the Customise button, but by default it'll just fix both of them. The installer should only work on Mountain Lion, and it should refuse to change apps on other versions of OSX. Also, it requires that Contacts.app and Calendar.app are in the usual locations. update 21 August: fixed link. Sorry! Should a banker be paid more than a nurse? I'm listening to BBC Radio 4's Public Philosopher. Today's topic is "Should a banker be paid more than a nurse?" I think the answer is "no". Banking services, though, are scalable, so individuals can get rich (and throughout, here, I mean filthy rich) providing those services. The next few paragraphs explain. the market values bankers more. Let's deal with talent and hard work first. Nurses often work extraordinary long hours. Their training requirements are higher, so they have more talent (both professions owe more to training than personality), and their knowledge base is broader. A banker may, perhaps, have a talent for economics than a nurse, but collectively the bankers don't seem to be in control. The nursing profession, on the other hand, doesn't have sudden widespread crashes in performance. Anything that looks like that would probably be a failure of public health professionals, or more likely the press; witness the MMR hoax. I think it's pretty clear that most people value nurses more than bankers. We'd all rather live in a society with no finance professionals than a society with no health professionals. We don't like it when our bank branch closes, but we protest when our local hospital closes. If society doesn't reflect that preference in individual pay, then that's because some structure in society isn't reflecting the aggregate opinion of its members. That structure would be the market. We all make a living either by creating wealth or by tapping the income or wealth of other individuals - usually through an organisation. But, wealth creation only happens through creating exchangeable physical products, say through agriculture or manufacturing. Neither bankers nor nurses do this. They get paid for providing services, which are not exchangeable. Service providers get their income from tapping the income or wealth of people who buy their services. There are two ways to get rich doing this: either tap the incomes of lots of other people, or tap the incomes of a smaller number of richer people. But, to get really rich, you need to provide a service that lots of people can use. That is, an impersonal service - one which you can provide many copies of. That service might be a music recording, a piece of writing, a televised performance or a bank account. Of course, you need an army of sales people to funnel the money your way, but those people don't need to be highly talented or well paid. In fact, it helps if they're not well paid. A nurse, however, doesn't provide a replicable service. She (or he, but usually she) provides a personal service that can't be duplicated. It has no value if you know you're going to get exactly the same service as the person in the next bed. Even if you have the same condition as your neighbour, you may respond differently to treatment, for example. And, even if you did need exactly the same treatment, the nurse can't provide that treatment on a CD, or over the web, to many people simultaneously. Nursing isn't a spectator sport. So, this is where the market fails. Any individual will value their nurse more than their banker. But no nurse will be able to get paid for nursing services by more than a few people at a time. OK, a nurse might write a book about nursing, or run a nursing company, but neither of those things are nursing (the first is writing, the second is provision of management services). In fact, the services that we value most are personal services. And, the people providing those services are never going to get rich, except by providing those services to people who are even richer. Oh, and if you're providing a personal service, and you want a higher income than your average client, then you need to be draining their wealth, or subsidised through taxation, or providing an occasional service that they really value. There are, of course, elements of the health service, in which people can get rich. They can do it by cherry picking clients (private health provision), but they can't get wealthy in the same way as a banker, or footballer, or pop star. They can do it in management, but they have to be managing a really large organisation, and probably in the private sector. They can do it in manufacturing of drugs or medical equipment - because drugs and medical equipment are replicable and therefore their manufacture is not a personal service. In fact, it's wealth creating, and it's scalable. I've made a Google calendar for the Liberal Democrats spring conference.